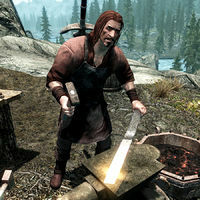 Stormcloak Quartermasters can be found in most of the Stormcloak military camps. Speaking to them will open the trade screen. Quartermasters wear a blacksmith's apron and a pair shoes. They are equipped with either a leveled two-handed weapon, or a leveled one-handed weapon and a shield (all up to steel quality). They also carry a steel dagger and a hunting bow supplemented by 12 steel arrows. This is the merchandise found in the quartermaster's merchant chest. These items are only available if purchased from the merchant; they cannot be pickpocketed or stolen. They are restocked every two days. This page was last modified on 3 September 2018, at 23:48.